Spotted this sweet looking M3 light tank which was deployed in the second world war from 1941 on. 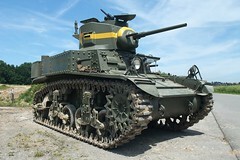 It has been used rarely as a combat tank,and used primarily for reconnaissance. A very fine looking light tank which would not look out of place as a robot tank in a sci-fi game. I am sure Ground Zero Games (GZG) have something which could be a close match. Chunky! Here is a web site for very affordable tanks. They make good mobile machine gun nests in FoW - the dinky little 37mm gun won't even scratch the paint of most German tanks, unfortunatly. Are they speedy in FOW? Just wondering if the reconnaissance role they played is something you can use them for in the game?